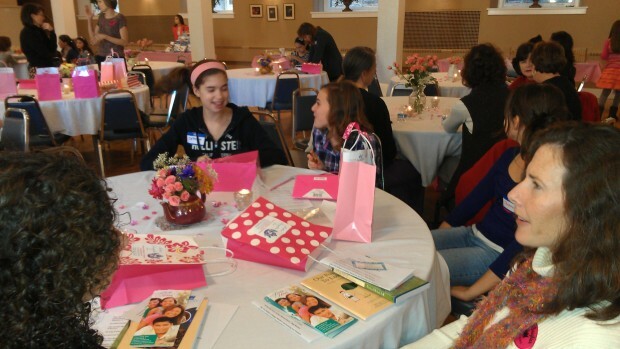 Friends of FertilityCare practitioners, girls and their mothers answer the “Fertility Fun Facts” questions during the Mother-Daughter Tea last month at Immaculate Conception Parish in Jenkintown. The Blessed Mother must have been smiling as the special mother-daughter fertility appreciation program took place at Immaculate Conception Parish in Jenkintown on Nov. 11. The Mother-Daughter Tea drew more than 85 participants and was well-attended by girls between the ages of 10 to 14 in the company of their mothers, aunts, grandmothers and the special women in their lives. The annual event was organized by Friends of FertilityCare-Philadelphia (FFC) in partnership with Generation Life and sponsored this year by St. Mary Medical Center in Langhorne. Generation Life and the FFC are both non-profit organizations who share a pro-life mission, the former among youth and the latter within health care. Generation Life has gained a reputation for promoting the beauty of chastity and modesty to young adults and is committed to building a culture of life and love among youth. The Philadelphia Friends of FertilityCare is committed to authentic life affirming health care for women and couples. The purpose of the program was to provide an atmosphere of love and learning while discussing the important topic of growing up and to establish a foundation for continued communication between parent and child. The girls had an opportunity to engage in guided discussions with the women who brought them and listened to age-appropriate presentations regarding the physical changes of the body, the functions of the female reproductive system, the sacredness of human life and the virtue of chastity. To help make the learning fun, the girls participated in a question and answer game that was engaging and informative. Mothers were provided with resources that they would be able to share with the girls at a time when they believed they were ready. Full-scale fetal models were on display compliments of the Bucks County Pro-Life Coalition and additional literature regarding authentic pro-life health care and Napro Technology was available for purchase. The program’s talks were led by FertilityCare practitioners who emphasized respect, understanding and appreciation for God's gifts, and by Stephanie Deutsch, a Generation Life missionary. Deutsch’s engaging presentation inspired the girls to focus on the virtue of chastity and the development of healthy relationships. The girls enjoyed her critique of the clothing worn in the “Modest is Hottest” fashion show. Women in attendance enjoyed the afternoon in the company of others with their daughters while learning the truth and beauty of God's design for love and life.